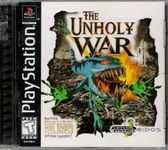 The Unholy War was a unique take on the fighting game. The story is as such: Renegade cyborgs known as the "Teknos" crash land their ship onto a planet rich in Aur, an important mineral. They immediately begin to spread, attempting to gain control of the Aur. However, the indigineous life on the planet fight back, and they take the name of the "Arcane". What ensues is an Unholy war between magic and technology. In Unholy war, players take control of either the Teknos Team or the Arcane Team (or both) in arena-style combat in an attempt to eliminate their opponent. Unlike usual fighting games, the arena is packed with terrain and obstacles and can be traversed by using the D-pad. Players will chase each other across the levels and attempt to reduce each other's life to zero. Each character has 3 attackes which are each activated with either the square, circle, or triangle buttons (x is jump, or fly). In this way, fights are more strategic than button mashing since each attack works a specific way. Attacks also drain energy, which is constantly recovering at a standard rate, and you can only use attacks you have the energy for. The game has two modes: mayhem and strategy. Mayhem is a good way to learn the game: it throws the players straight into the level(s) of their choosing and lets them fight until one side has no characters. Strategy mode involves a board where resource sites must be mined to buy warriors in an attempt to destroy the enemy base and team. In addition to fighting, each character boasts one "map power" usable for a resource cost in strategy mode.